John Ernst, principal at Rolling Ridge Elementary School, has been honored as the District 1 National Distinguished Principal for 2015-16 by the Kansas Association of Elementary School Principals (KAESP). Six district honorees will be recognized at the KAESP Fall Conference on Nov. 9 in Wichita. Police determined Thursday afternoon that the rear window of police vehicle experienced a stress fracture that caused the window to buckle, and that no shots were fired at the officer. Students in the Olathe School District scored a composite score of 24 on the ACT exam, the highest in the district’s history. The test was taken by 71 percent of 2015 graduates. The scores were well above state and national peers. Kansas State will be adding some pretty impressive names into its Ring of Honor. 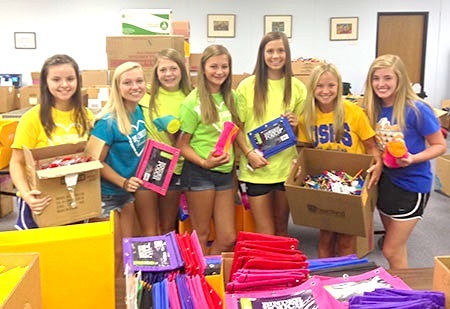 Quarterback Michael Bishop, receiver Jordy Nelson, running back Darren Sproles and safety Clarence Scott will be inducted on Sept. 5 in Manhattan, Kan.
Olathe South High School cheerleaders spent time opening large packages of supplies so volunteers from Farmers Insurance could more easily get the right number of each item into the backpacks. Summer time for high school students can mean working more hours in a part-time job or it can just as easily involve volunteering their time. Dozens of Olathe high school students spent part of their summer break helping with projects in district buildings. An Olathe woman, who says a coyote killed her dog last week, is sending out a warning to people with small pets. Olathe police say it’s not uncommon to see coyotes and foxes in neighborhoods. Police say the wild animals are usually on the hunt for food from vegetable gardens, trash cans and pet food left outside. Julie Vollertsen, says her 12-year-old Shih Tzu mix, Tyson, was killed by a coyote last week after darting out the front door of her Olathe home.